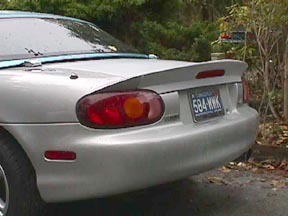 At long last the new Spoiler Trunk Lid designed by Dale Wampler for the second generation Miata is now available. As there are a number of handmade parts in each one they go out on a first order in, first out basis. What you get is a full new trunk lid complete with its inner liner bonded in, the two spoiler extensions, a template for drilling the holes in your rear fenders, an LED third brake light and stainless steel surrounds for your license plate lights. 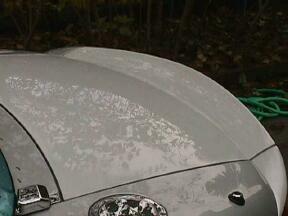 The trunk lid bolts in place using the stock hinges, original nuts and the striker latch from your original trunklid. See the pics of Dale’s car (the dark blue one) and you will get the idea of how it looks with the M-2 quad tail lights. This full replacement trunklid is made one at a time by highly skilled laminators using hand lay up (Race Car Style) which makes for consistently light weight very strong parts. 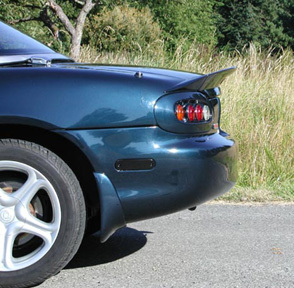 Considerably lighter than the factory lid, your new trunk lid will give you no issues on the normal factory torsion bars. They come finished in primer gel coat and are an easy block sand for the technician at the body shop. Price: $800.00 + $150.00 Shipping.